One skein of the recommended yarn is enough to make both bags. This is a fun set of beach bags with some interesting twists (literally) in the stitches! 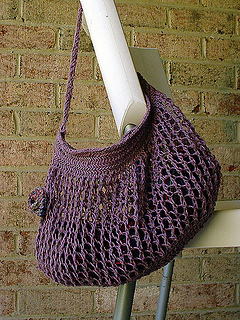 The Itsybitsy bag is knit in one piece, from upper lip to the base, then cast on the wraparound strap and knit it together with the bottom, then back to the top. Short row shaping made the bag sides wider than the handle of the strap. The seams help the bag keep its shape. The itsybitsy bag needed a larger sibling, for those whole-family swim days. Whereas itsybitsy keeps it shape well, Kitchen sink has a more relaxed shape. 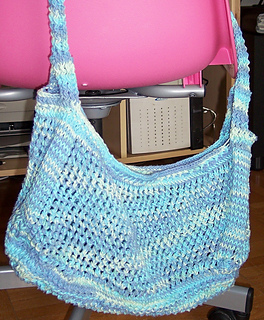 The Kitchensink bag is knit in one piece, starting with a rectangular base with rounded corners, knit on two needles. Stitches are picked up around the base and the sides are knit on circular needles in the round. The strap is worked from the top of the bag, and attached via Kitchener stitch or 3-needle bind-off -- no seams! Both Itsybitsy and Kitchen sink were knit from one large ball of cotton. Both stretch to hold amazing amounts of stuff.